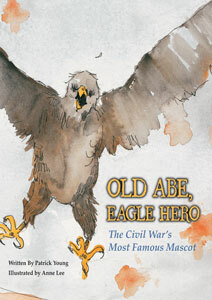 Old Abe, War Hero: The Civil War's Most Famous Mascot by Patrick Young, illustrated by Anne Lee. (Grades 1-5.) Kane/Miller, September 2010. Unpaged. Review copy provided by publisher for Cybils Award consideration (this review reflects only my own opinion). You knew people fought in the Civil War, but how about an eagle? Old Abe was a bald eagle, captured as a fledgling and traded to a farmer named Dan McCann. The Civil War was raging, but Dan McCann could not fight because of his bad leg, so he donated the eagle to a company of Wisconsin soldiers who adopted him as their mascot (they named him Old Abe after president Lincoln). Since Old Abe had been raised by humans, he had no fear of them and he quickly bonded with the soldiers, who carried him into battle on a wooden perch. As bullets whizzed past, Old Abe inspired his company and bolstered their courage. He even dragged an injured soldier out of battle and warned his company of an approaching Rebel soldier, leading to the capture of a Southern camp. Old Abe retired in 1864, after participating in 25 battles, and was given a deluxe suite at the Wisconsin Capitol Building (complete with private bird bath!). Old Abe, Eagle Hero is an interesting and engaging story that's perfect for history buffs or to add variety to a unit on the Civil War. It's just the kind of nonfiction picture book I love - a little known story that turns out to be really cool. The illustrations compliment the text, the blue, gray and orange color scheme nicely invoking the time period. Anne Lee's depiction of Old Abe captures the movement of an eagle in flight and adds much to the text. This is a true story that will capture the imaginations of young readers... BUT. Where are the source notes?! Albeit, the jacket flap tells me that Patrick Young is "the great-grandson of Capt. Victor Wolf, commander of Company C of the 8th Wisconsin Volunteer Infantry, 'the Eagle Company'" and "He grew up hearing stories about Old Abe from his grandmother and mother..." And I learned from this interview with the author that he "did further research to expand and update the book" (an edition was published in 1965). However. I wonder how we're supposed to expect kids to learn to cite their work if we're not making source notes and citations a priority in our books for children. A list of sources or an author's note explaining that the stories had been passed down through his family would have added so much to this book and raised the overall quality. All that said, it's still an engaging story about the Civil War and it's accessible for kids. Check out more reviews at The Fourth Musketeer, Bull Runnings (includes further research about Old Abe's death and some photos! ), Jean Little Library, the excelsior file (who points out many apparent factual inaccuracies...) and Not Just for Kids. Old Abe, Eagle Hero is on shelves now!